Nifty fifty look who's turning 50! Celebrate a milestone with 50th Foil Silhouettes (1/pkg). 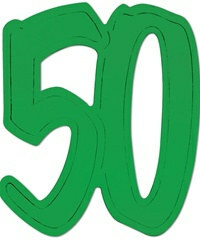 50th Foil Silhouettes will add fun and color to the festivities. Celebrating turning 50 with style and class. Each package consists of one 50 cutout coated in blue, green, yellow, orange, purple or red foil. We have an assortment of decorations available in our 50th Birthday section to help make turning 50 that much more memorable. Unfortunately, you cannot request colors and if you order more than one you will receive an assortment of colors.